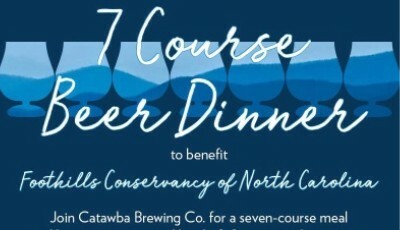 Catawba Brewing Company will host a seven-course beer dinner on Sunday, April 14 at 5:30 p.m. at its new location, formerly Buff Tire Service Center, across from the Catawba Brewing Company taproom in downtown Morganton. Chefs from restaurants in the foothills and Piedmont regions will prepare seven courses, each of which will be paired with a complementary Catawba Brewing Company craft beer. ﻿ Proceeds from the event will be donated to Foothills Conservancy.